At 6-foot-7, John Miller stood tall on the basketball court. And, during his basketball career, which spanned from Wooster High School to several professional leagues, Miller’s achievements became bigger and bigger. 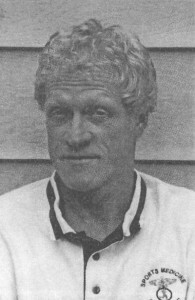 Miller, the half-brother of the late Bill Musselman, also a Wayne County Sports Hall of Fame member, lettered three times in basketball at Wooster High. As a senior, he averaged 20.5 points and 13 rebounds a game as the Generals won the Cardinal Conference and he was named Cardinal Conference Player of the Year and honorable mention All-Ohio. From WHS, Miller went to Xavier University for a season, where highlights included a nine-point, nine-rebound effort against Tennessee, whose team included future pros Bernard King and Ernie Grunfeld, and a game against eventual national champion Marquette. Upon transferring to Bowling Green, Miller became a three-year starter, although he began to battle chronic knee problems. Healthy, he averaged close to 15 points a game for the Falcons, and he completed his career there with averages of 8.2 points and 4.8 rebounds. An individual highlight came when Miller was named the Most Valuable Player of the Toledo Blade City Classic, and during his time at BG he matched up against players the likes of Kevin McHale, Clark Kellogg, Herb Williams, Albert King and Buck Williams, all of whom would go on to lengthy NBA careers. The Falcons won the 1979-80 Mid-American Conference championship and played in the NIT. Following graduation, Miller journeyed down under for 2 ½ seasons of professional ball with the Dandenong Rangers, based in Melbourne. Leading the team with averages of 25 points and 12 rebounds, Miller was a two-time team co-MVP and All-league selection, and was the 1982 Victorian State Championships MVP. Back closer to home, he finished his pro career with two months in the CBA, where he averaged 4.5 points and 3 rebounds a game for Toronto. Miller was a fixture on numerous area teams after that, and also won an Ohio Regional Campus Conference title coaching Wayne College before coaching nine seasons in the program at his alma mater, Wooster High. Miller, who teaches exercise science and sports medicine at the Wayne County Schools Career Center, lives in Wooster with wife Elizabeth and their two children, son Sean and daughter Alison.